Stained Concrete is a great choice if you are looking to spice up your concrete slab. 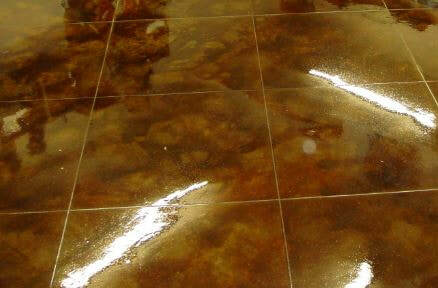 There are various ways to stain concrete to get the effect you are looking for. 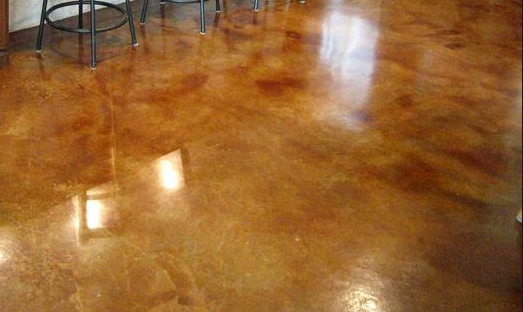 Stained concrete can be a great choice for businesses. We take the concrete slab, grind it so it is porous and then stain the slab. We stain the slab multiple times and then polish it so that it gets the right effect. We are experts in staining concrete in both a residential and commercial setting. Whether you are a residential property owner or a commercial property owner concrete floors are beautiful and popular choice that are suitable for any area of your home or business. Stained concrete is easy to clean, durable and offers a high reflective shine that has become the go-to flooring choice for homeowners and business owners alike. Port St Lucie Epoxy Pros has the expertise you want to install Stained concrete that will last through a lifetime of heavy traffic. We offer clients smooth flooring with top tier materials and state of the art equipment to achieve the effect so that you can feel proud to have selected us for your flooring choice. We do acid stains and water stains. There are multiple ways to skin a cat and we make sure to do the job that fits your needs.Stained concrete is a strong and durable material selection for your home or commercial property. In fact, they are well known as a long lasting feature and can be guaranteed to stay in tact for as many as 20 years because even with high traffic they are will not dent or chip like many other materials such as tiles or other types of soft materials. And with routine maintenance and care it is definitely possible for your Stained concrete to last far longer than the original 20+ years. But for sure, you must hire a concrete contracting company that has the deep experience and skills to install flooring that is of top quality. Staining concrete can be a great way to go. The prices are very dependent on the condition of the current slab. If the slab is good, we can grind stain, polish and leave you with a beautiful floor. Many times stained concrete can go up in price if the slab is fractured or has cracks that need repair. A lot of pricing is dependent on the surface prep we need to do prior to staining. No other polished flooring contractor can meet our top rated standards while also offering affordable prices. Call us today to provide you with a free estimate.